The community of Cordova is separated from the main road by a short spur, which plunges into the Quemado Valley about four miles east-northeast of Chimayó. 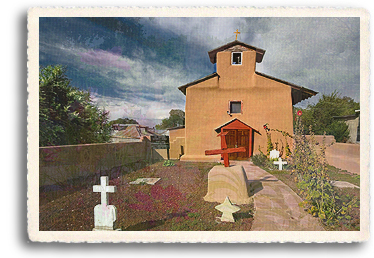 The Spanish settlement of Pueblo Quemado was founded as an expansion from the Chimayo valley, and named for an ancient Indian pueblo which had long since been reduced to ruins by fire. The small community was abandoned in 1748 due to Indian attacks, but was permanently re-settled by 1750, and renamed Cordova for a prominent local family. Cordova later became famous as the home of the Cordova School of woodcarving pioneered by Jose Dolores Lopez (1868-1937). A Santero, or carver of Santos, Lopez made his living also making carved and painted screen doors, frames, nichos, shelves, chairs, tables, and even mailboxes and coffins, as a maker of paper flowers and filigree jewelry and a weaver. He also served as the town cobbler. Santos, literally "saints" in Spanish, was originally a term reserved for holy personages, including the saints as well as the Holy Family and for blessed objects which represent or are associated with them. The term santero referred to a wide range of persons who cared for a church or chapel and its furnishings or who made, repaired, or repainted images. While the term santos has evolved into a broader meaning, including spiritually significant icons as well as animals and other folk images, the meaning of santeros has narrowed, now referring only to those who carve santos. The "Tree of Life" is an image which has become an icon for the Lopez family of Santeros. Lopez's early Santos were painted in the traditional style, but in the 1920s, Santa Fe artist Frank Applegate and writer Mary Austin suggested he produce plain, religious imagery that would appeal to Protestant tourists from the Eastern United States. In response, Lopez developed a unique style of intricately carved pieces which were left unpainted, making use of the natural grain, knots and unusual shapes of local woods such as juniper, aspen, ash, and cedar. This style is still carried on by his descendants. In particular, his son George grew up in the tradition of New Mexico Catholicism and Santos carving, watching his father work at his craft. Although he enjoyed whittling as a young man, he did not pursue a career as a santero until later in life. It was only after working with the Denver and Rio Grande Western's narrow-gauge lines in New Mexico and Colorado, and later with the Union Pacific Railroad in Rawlins, Wyoming. To pass the nights in railroad camps, George began making small santos similar to the ones he had seen his father make. His first significant piece, he recalled, was the "Tree of Life," which he claims he originated as a kind of Adam and Eve creation story based on a Garden of Eden carving his father once made. 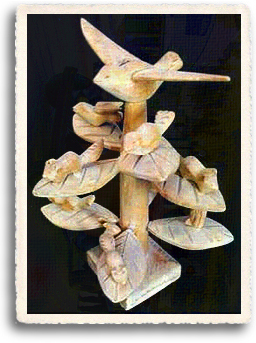 Following World War II, George decided to devote himself full-time to woodcarving. As did generations before him, Lopez produced other woodwork in addition to his religious subjects, carving animals, such as burros, sheep, and goats, but he always preferred the traditional santos. The work of George Lopez would become known world-wide, and in 1982 he was awarded National Heritage Fellowship by the National Endowment for the Arts. George had no children, but taught his nieces and nephews his art, which is carried on today by his niece Sabinita Lopez de Ortiz.